Culture | The use of fabric in a wedding table decoration simple and inexpensive solution. 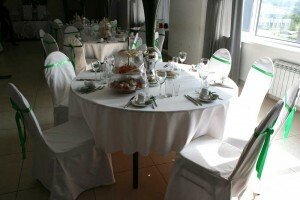 The use of fabric in a wedding table decoration simple and inexpensive solution. Interior of the cafe at the feasts may contain elements that are involved in carrying out the celebration.A large vase in the decoration of the table for the guests at a wedding party creates a sense of the grandeur of the event. Also, a large vase, rushing up, with low ceilings visually enhances the space.